A Masdar Institute PhD student has become the first UAE National in the country to defend a thesis in the field of earth observation and ocean color remote sensing, which is an area of research that is focused on monitoring and protecting the marine environment. 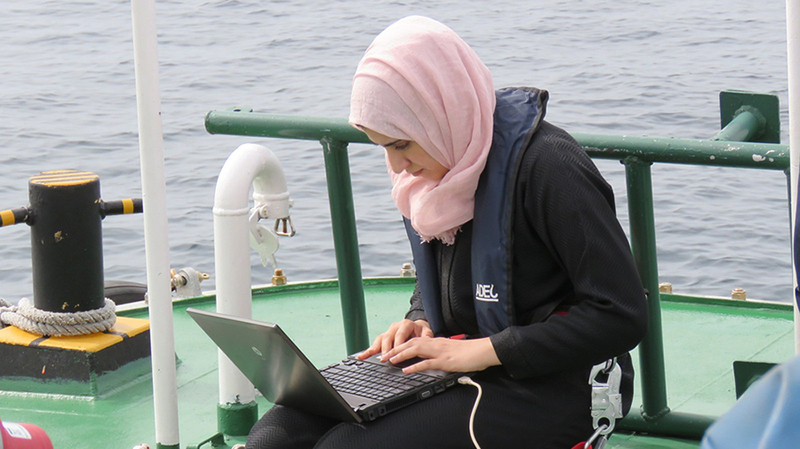 In her thesis, titled “Characterization and Detection of HABs in the Arabian Gulf,” PhD student Maryam Rashed Al Shehhi explains how she has developed an advanced, regionally-adapted model to detect harmful algal blooms (HABs) in the Arabian Gulf – a tool that could potentially result in significant economic, environmental and public health savings for the country. HABs, also known as red tides, occur when colonies of algae grow out of control in the water, consuming excess amounts of oxygen and/or producing toxins, which has detrimental effects on marine organisms, coastal resources, public health and local economies. In the UAE, HABs have resulted in significant economic losses due to reduction in tourism, public illness, and closure of coastal fisheries and seawater desalination plants. In 2009, the Ghaleelah seawater desalination plant in Ras Al Khaimah was forced to shut down for up to ten hours a day for several days due to a HAB event that caused damage to the plant’s membranes and clogged its intake filters, resulting in financial and water supply losses. In a review paper of HAB outbreaks in the Arabian Gulf, which was published in the Marine Pollution Bulletin in 2014, Al Shehhi explains that the primary reason behind the algae bloom outbreaks in the Arabian Gulf is due to the water’s high nutrient concentration, which is caused in part by the abundant level of dust that accumulates in the water and by human activities, which include wastewater discharges into the Gulf. These activities have significantly increased the nutrient load in the water, which in turn has increased the rate of algal bloom occurrences. Responding to the challenge that rapidly occurring harmful algal blooms are posing to the UAE, Al Shehhi focused her thesis research on the development of an advanced model that will help monitor, forecast and predict when and where these harmful blooming events will occur. Currently, environmental remote sensing satellites, like the multi-spectral ocean color sensor aboard one of the United States National Aeronautics and Space Administration’s (NASA) earth observing satellites known as the Moderate-resolution Imaging Spectroradiometer (MODIS), are used to detect the presence of algal blooms around the world, including the Arabian Gulf. MODIS works by measuring the wavelengths of light reflected by different environmental parameters and objects, including surface temperatures, vegetation and algae. It collects this data at a spatial resolution of one kilometer in the visible and infrared wavelengths with a repeat cycle of one to two days. While the information provided by MODIS and other remote sensing satellites are extremely helpful, these satellites alone do not provide enough information needed for near real-time monitoring of potentially harmful blooms, due largely to limitations posed by reduced visibility form high concentrations of dust in the atmosphere and limited frequency of satellite revisits to monitored locations. Thus for a more robust and reliable monitoring system, an advanced model is required, one that incorporates the combination of field measurements and remotely sensed data. That is why Al Shehhi and a team of researchers from Masdar Institute collected and analyzed bio-optical, physical, chemical and spectral data from various points across the Arabian Gulf off the UAE’s coast between 2013 and 2016. “Based on these data, we have developed a regionally-adapted and more precise model than the conventional ocean color models to detect HABs accurately from the MODIS sensor,” Al Shehhi shared. Al Shehhi believes that the combination of field measurements and remotely sensed data will allow for the development of a reliable, physically-based model that will eventually be converted to a format that environment stakeholders and managers can access and use through mobile devices and web portals. The three-member PhD committee that reviewed Al Shehhi’s thesis research included Dr. Hosni Ghedira, Director of the Research Center for Renewable Energy Mapping and Assessment (ReCREMA) and Professor of Practice, Dr. Hector Hernandez, Assistant Professor of Chemical and Environmental Engineering, and Dr. Dara Entekhabi, the Bacardi and Stockholm Water Foundations Professor of Civil and Environmental Engineering at the Massachusetts Institute of Technology (MIT). Al Shehhi will receive her doctorate degree at the 2017 Masdar Institute commencement.